Solar Coaster visualizes the rise and set of Earth's nearest star, Sol, our Sun, and probes upcoming solar and lunar eclipses. Solar Coaster is available in three distinct flavors: an App for iOS and macOS, a Today Extension for iOS and a Screen Saver for macOS. Solar Coaster's algorithms are accurate at all longitudes, and latitudes between -81° south and +82° north. Of course, you must have Location Services enabled1 and allow Solar Coaster to access your position for accurate simulation results, and to properly detect eclipses visible at your location. A sinusoidal curve depicts Sol's path for a single day, Today. An artificial, horizontal, horizon is drawn such that it intersects the curve at precisely two points, Sunrise and Sunset. This means that all points on the curve above the horizon are Day, and those below are Night. As the length of the Day/Night changes this horizon shifts up and down the sinusoidal curve. The actual Sunrise and Sunset times are also displayed, in 12 or 24-hour format. The point exactly midway along the Day portion of the sinusoidal curve is called Solar Noon, and represents the time of day Sol is farthest above the horizon. Solar Noon typically does not coincide with 12 o'clock Noon. The point exactly midway along the Night portion of the sinusoidal curve is called Solar Midnight, and represents the time of day Sol is farthest below the horizon. Solar Midnight typically does not coincide with 12 o'clock Midnight. Dawn precedes Sunrise, and Dusk succeeds Sunset. During these times of Twilight Sol slowly brightens and dims appropriately. Earth's nearest celestial neighbor, Luna, our Moon, sometimes makes appearances during the visualization. At Moonrise a smaller, secondary, sinusoidal curve appears and Luna fades-in. Luna is drawn with its proper phase, and rotated to the precise phase angle. At Moonset Luna fades-out. Touching either Sol or Luna displays a tiny bit of additional realtime information (unavailable for the Today Extension and Screen Saver). Solar Coaster has various settings, help and auxiliary information. For the iOS App touch Settings / Solar Coaster. For the macOS App use its Solar Coaster and Help menus. For the macOS Screen Saver use System Preferences / Desktop & Screen Saver / Screen Saver Options. For iOS touch Settings / Privacy / Location Services, ensure the service is on, then scroll down to Solar Coaster and enable While Using the App. For macOS click System Preferences / Security & Privacy / Privacy / Location Services, ensure the service is on, then check both Solar Coaster.app and ScreenSaverEngine.app. Once a minute orbital calculations are performed and the visualization is updated. This means that if you are patient, very, very patient, you can watch Sol and Luna move! For those not so patient, touch above the horizontal horizon line and switch into manual, You Drive, mode (unavailable for the Today Extension and Screen Saver2). The simulation is paused and the scene is augmented with informative data, various small, circular, marker points, three larger, colored, touch discs, Solar and Lunar Eclipse Probe controls, and a timer, which begins at +0:00, Now. The white markers represent the cardinal times of the day: Solar Midnight, Dawn, Sunrise, Noon, Solar Noon, Sunset, Dusk and Midnight. The yellow marker is Now. The minusculely smaller, silver, markers indicate Moonrise and Moonset, assuming there is a rise and/or set for Today. Touching a marker displays its time (unavailable for the Today Extension and Screen Saver). Touching the cyan disc animates the simulation through the special marker times, and those times only. Touching the orange disc animates the simulation through the entire day of 1,440 minutes. Touching and sliding the yellow disc animates the simulation to a random minute of the day. Touching an Eclipse Probe control initiates a search for upcoming solar or lunar eclipses, and if one is visible from your location the You Drive simulator is temporarily reset to that date and the eclipse circumstances are displayed. In all cases the timer shows the elapsed time in hours and minutes of the simulation, whether positive or negative, relative to Now. Touch above the horizontal horizon once again to exit You Drive mode and resume the actual simulation. Don't be surprised if you notice the visualization catch up for lost time. And depending on what the time differential is and whether the simulation time is before or after Now, the tweening may be fast or slow or forward or reverse. The Solar Coaster Apps for iOS and macOS are available from their respective App Store and install in the standard manner. The iOS Today Extension is bundled with its App and becomes available after the App has been installed. App Store security considerations require that the macOS Screen Saver be a separate bundle, so download it from BigCatOs. To install the iOS Today Extension activate Notification Center (swipe down from the top of the screen), swipe right as needed to reach the first page, then, at the bottom of the screen, touch Edit. Now you can add and/or subtract Today Extensions. To install the macOS Screen Saver fetch SolarCoasterSS.zip and unzip it, which creates the module Solar Coaster.saver. Double click the saver module to finish the install and select it from the Desktop & Screen Saver preferences. Be sure to enable Location Services1, described in the Overview section. And that's Solar Coaster. Enjoy. 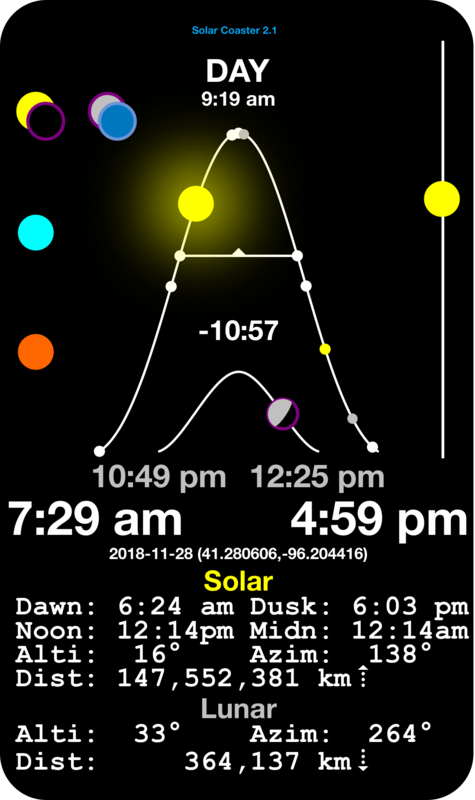 Any similarity to the Apple Watch Face Solar is, indeed, intentional.